Summary. 6RAR/NZ (ANZAC) companies on Op MARSDEN in AO GULLIVER successfully operated on and around the remote NUI MAY TAU mountains in NW Phuoc Tuy Province, an area that had escaped regular operations thus allowing 84 Rear Service Group and other VC provincial organisations the freedom to build a logistic rear area to support VC operations in the 1ATF area of interest. Op MARSDEN saw companies locate and destroy extensive logistic facilities and large caches of supplies. However W Coy operations were again very much a side-show to the other companies, with the Coy placed to a flank and away from the major VC facilities on and around the mountains. Main body comprising Bn HQ and D Coy in APC with Centurion tank troop departed FSPB DISCOVERY at 0700H, arriving in the area of the new FSPB PICTON YS642907 at 1112H. 1202H 1st lift of W Coy departed FSPB DISCOVERY for FSPB PICTON, Coy complete at PICTON at 1327H. W Coy was part of a large air move which included the bulk of Bn HQ, the ATk and Aslt Pnr platoons and the W Coy mortar section from Support Coy. The W3 mortar sect was on the ground and available for fire support shortly after noon, joining two Aust mortar sections who had travelled in AMC with the armoured column. 1400H W3 Coy departed FSPB PICTON to secure the area to the west of PICTON [W Coy task 3 in the Op MARSDEN Op O 12 dated 27 Nov 69]. The area around PICTON had many active trails made by regular movement of VC parties and couriers and air strikes were called for especially late afternoon when the DS helicopter was fired on by a ground party. 0630 a boundary clearance was granted W Coy from YS610890 to YS640962 ‘until further notice’, this allowed the Company to work up against the Song Rai river banks, an opportunity they exploited to the full. 1530H at YS623898 3Pl located a cache of two holes covered with plastic sheeting and wood. 137 CHICOM grenades, 35 AP mines, 5 anti-veh mines and 11 Bangalore torpedoes recovered and most destroyed, 5 examples of the grenades and AP mines were backloaded for inspection as being a type not previously seen. W Coy night locations were HQ and 1Pl YS623904, 2Pl YS629904, 3Pl YS622898, generally 2Km west of FSPB PICTON and close to the water courses in the area which had been identified as navigation aids for parties of VC relying on local knowledge to move around the area. 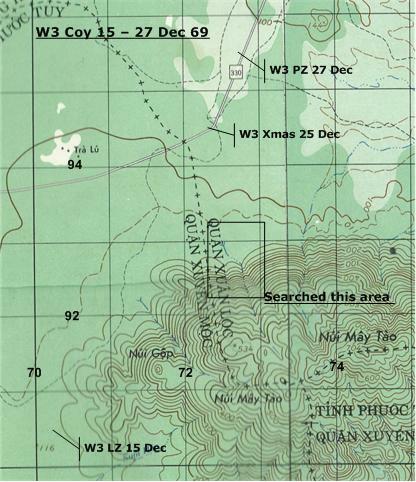 Contact: 0835H 1Pl at YS622904 contacted 3 VC, 2 VC KIA [BC] with the 3rd body KIA located on 6 Dec by the A/Tk Pl. The contact was the first major clash W Coy had with the VC and is fully explained at this link. W Coy night locations were HQ and 1Pl YS623904, 2Pl YS629904, 3Pl YS622898 [because they were in ambush locations there was no change from 2 Dec]. 0815H at YS622899 3Pl located a cache of 11 Bangalore torpedoes and 23 grenades, these were destroyed. Minor patrol movement otherwise. 0920H W Coy at YS633916 located tracks of 5-10 VC 24-hours old going east to west. 1647H at YS622914 3Pl in ambush on well-used north south track, 2Pl also in ambush at YS633916. 2043H W Coy and D Coy both reported automatic fire and explosions at YS668960, as there were no allied troops at that location it was thought to be an accidental clash between VC patrols and Bn HQ engaged the area with artillery from FSPB PICTON. 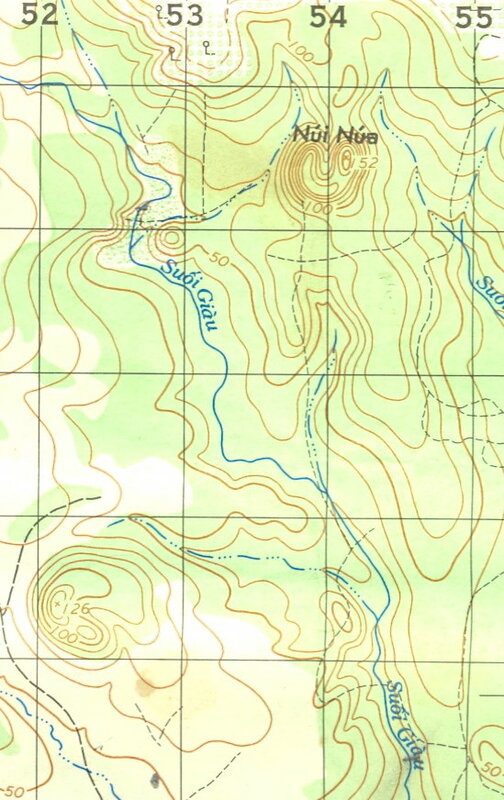 W Coy began to move north following the Song Rai River and other tributaries, and searching the flat ground between tributaries looking for bunker systems and caches. 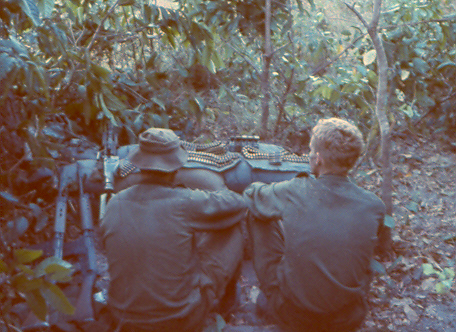 Contact: 1505H at YS626928 2Pl contacted 2-3 VC, 1VC KIA [BC] 1 VC WIA [BT] 1 M1 rifle captured. 0930H at YS624928 2Pl located bunkers and tentage with male and female clothing, some SAA and food and correspondence. 1200H at YS633940 2Pl located 4 new bunkers and a cookhouse, a few items of interest were recovered. W Coy night locations were Coy HQ and sect 3Pl YS640949, 1Pl YS633952, 2Pl YS634940, 3Pl – YS636959. While Coy HQ remained static near the top of the .149 feature the platoons started to swing NE along the general direction of the Suoi Trung watercourse as earlier directed in the Bn Op Order. 3Pl rejoined Coy HQ during the afternoon. From entries in the diary the platoons continued moving in a NE direction away from the river system [which was assisting navigation] into more featureless terrain under a high canopy and recorded LOCSTATS for 11 Dec 69 might be inaccurate [see comment for 12 Dec]. 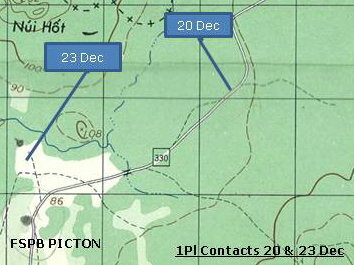 When 2Pl at 1630H identified a sizeable occupied camp at YS662970, W Coy planned to assault it early on 12 Dec, however Bn HQ kept the ground troops back from the area so they could coordinate an artillery fire plan and arrange for helicopter gunships to pound the area before the infantry assault. W Coy night locations were reported as Coy HQ, 1Pl and 3Pl YS657962, 2Pl YS663967. Contact: 0705H at YS662981 [the diary says this is the corrected grid reference for the enemy camp, 1100 metres further north than 2Pl reported] W Coy assaulted into the camp [see this link for more comment]. The VC evacuated the camp by withdrawing NW along a small re-entrant as soon as the artillery fire plan started and only one VC KIA was located. 101 Bty RAA engaged YS652975 and YS677972 in support of the attack while the US 155mm guns at FSPB PICTON fired on YS661979. The camp was occupied by 25-28 VC, 2x AK47, 2x SKS rifles, 2x M1 carbine, 2x K54 7.62mm CHICOM pistols and 25 packs were captured. Packs contained a total of 500 Lbs of lentils, 15 Lb sugar, 20 Lbs rice, 20 Lbs tobacco, 10 Lbs noodles, and quantities of personal equipment and documents which identified the VC as the BA LONG Procurement section with elements of MR7 and 12 other VC units. W Coy night locations were Coy complete at YS657962, their reported location from the previous night, suggesting W Coy didn't agree with the Bn HQ corrected LOCSTAT. Neither do the artillery impact grids, at least one artillery site should have been the camp site where the VC occupant was KIA and left behind. W Coy was re-positioned during the morning – W Coy less 1Pl airlifted from LZ YS677957 to YS701906, with 1Pl being airlifted from LZ YS677957 to FSPB PICTON to replace other elements [mainly ATk PL] being redeployed, role to assist FSPB defence and conduct local TAOR patrolling. The Company less 1Pl moved from the LZ as a column NE to the foot of the NUI MAY TAU into an area recently patrolled by B Coy, tasked to keep looking for a prisoner of war camp [US pilots possibly] and other logistic facilities thought to be in the area. W Coy began to move into the higher ground to their south, concentrating on a major re-entrant in YS7292. 0750H at YS725931 3Pl located a cache on a 6’x4’ platform 3’ off the ground and covered in green plastic. The cache had 400 Lbs rice flour, 600 Lbs crushed maize, 100 Lb dried berries, 41 x 1 Lb tins of fish, 4 gal tin of fish oil, 10 Lb MSG, 2 bottles tomato sauce, documents, cross-cut saw, bandages, and 100 phials of mivaguine caffeine coramine [possibly used to assist wounded VC function after being wounded, as the drugs help control the beating of the heart and the narrowing of blood vessels]. 1445H at FSPB PICTON Col R Ange, Regt Col RNZIR arrived for an overnight stay; he would have visited with the mortar sect and 1Pl. 1515H at YS756900 [NUI MAY TAO] 3Pl A Coy was engaged by an unknown number of VC, 3x Aust [including the platoon commander] were either KIA or DOW before able to be evacuated, and the DUSTOFF helicopter was also fired on during the evacuation. The VC positions were engaged by mortars, artillery, air strikes and LFT. The mortar section at FSPB CASTLE was required to fire at the sustained rate during the engagement and the W3 mortar section at FSPB PICTON worked hard to prepare additional 81 mm HE bombs by opening the wooden boxes, cutting open the waxed cylinders and bagging the rounds for easy access and carriage, in time for an ammo resupply to be flown into FSPB CASTLE to keep their mortar line and the A Coy platoons operational. Contact: 1210H at YS664921 [near FSPB PICTON] 1Pl contacted 4 VC with unknown result, 19 AK47 rounds were recovered. The VC group moved between the sentry on the gun position and a soldier ‘squatting’ a little too far forward of the MG so that the gunner was unable to engage until the party had moved further away. The VC escape trail went into a dip then straight through a large clump of spiny bamboo so they were hurting but alive afterwards. 1600H at YS728924 3Pl located a cache of a 4 gal tin in a cave. Mainly personal documents recovered including a number of ARVN ID cards and documents. During the day the Company withdrew north to the flat ground and ambushed tracks in the area. There was minor movement during the day. W Coy night locations were Coy HQ and 3Pl YS724940, 2Pl YS719945, 1Pl YS642913 in ambush on a track. Contact: Not recorded in the Diary - while 1Pl were still in their night location [near FSPB PICTON] a small party of VC entered the ambush and one was KIA when the claymores were detonated. Another VC fired a RPG into the position before the VC party fled the scene. Despite an extensive search no VC weapon was found in the vicinity. 1725H all elements were advised of a 24-hour Christmas Truce commencing at 1800H - Coy were not to initiate contacts but were to defend themselves. No H&I were to be fired. 0955H Comd NZ Forces Vietnam visited FSPB PICTON, he would have visited with the mortar sect and 1Pl. 0900H at YS728955 W Coy commenced airlift to FSPB PICTON enroute to NUI DAT. On either the 27th or 28th Dec Maj Torrance spoke to W Coy to sum up the company experiences to date - see this link for the text. W Coy night locations were the company lines in NUI DAT. 1800H FSPB PICTON was officially abandoned as D Coy are withdrawn, along with the W3 mortar sect which remained until the last moment as fire support for D Coy. 1500H at Bn HQ flag station NUI DAT, the ANZAC battalion mustered for a memorial service. The companies were paraded in ranks six deep in a hollow square but with W Coy behind D Coy. Flags of 6RAR and RNZIR were lowered to half-mast at 1315H and troops marched on to the parade at 1445H. The parade lasted an hour; the pipe major was present and must have played a lament. Op BLUEWATER in AO DRURY. Op BLUEWATER was an attempt to locate VC D445 Bn in the Suoi Giau stream/ Tan Ru area 12 Km north of the Horseshoe and NW of FSPB DISCOVERY. 6RAR OP Instr 26/69 [ironically signed on 1 Jan 70] outlined three separate company operations, W, B and D companies each being deployed into different parts of the AO for three days in sequence. 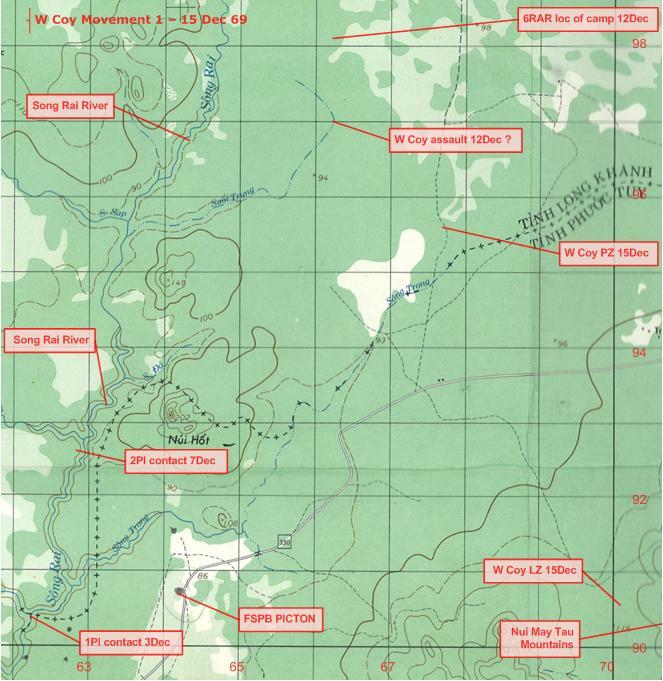 Fire support was by US 155mm guns from NUI DAT as the only 105mm field artillery that could reach the AO was at the Horseshoe and their range was limited to the southern area only. Companies were expected to draw water from local sources, difficult to do in the dry season. and the faint black spot just above the border is the intended LZ. The Suoi Giau stream is to the right. W3 Coy was to fly into an LZ at YS528701 after artillery preparatory fire and then search from YS544713 north to around YS528742. The PZ was directed as YS528742. W Coy was deployed by helicopter on 30 Dec 69 and withdrawn by helicopter back to NUI DAT on 1 Jan 70. The LZ W3 Coy were to use was set ablaze by the preparatory artillery fire and the helicopters then dropped the company into a unprepared LZ ‘somewhere else’. In extremely hot dry conditions the company then trekked north along the general direction of the SUOI GIAU stream until extracted, with most navigators being completely in the dark as to their real position on the ground. There was no sign of or contact with any VC. 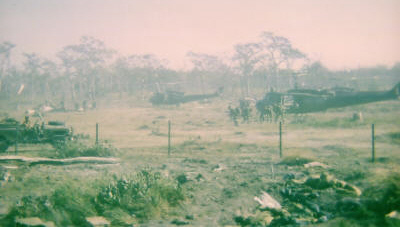 W Coy spent News Years Eve in the bush and were back in NUI DAT on 1 January 1970. W Company celebrated Christmas following Op BLUEWATER.